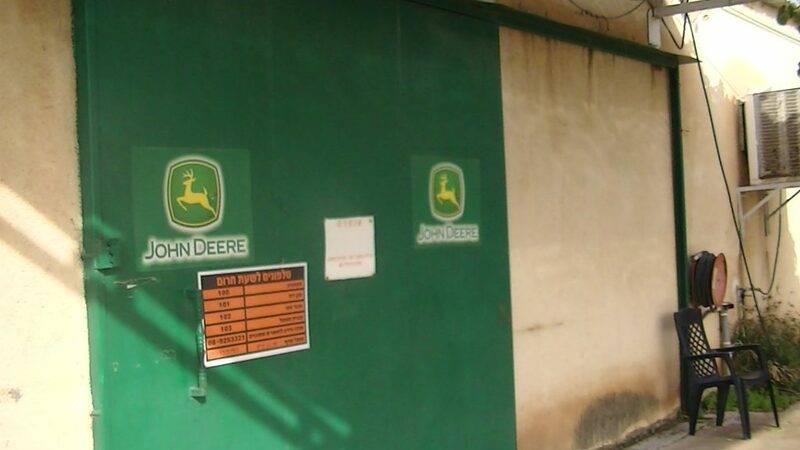 John Deere (Deere and Company), the American manufacturer of agricultural machinery and irrigation equipment is partnering with Israeli companies which advertise John Deere equipment in a West Bank settlement in the occupied Jordan Valley. 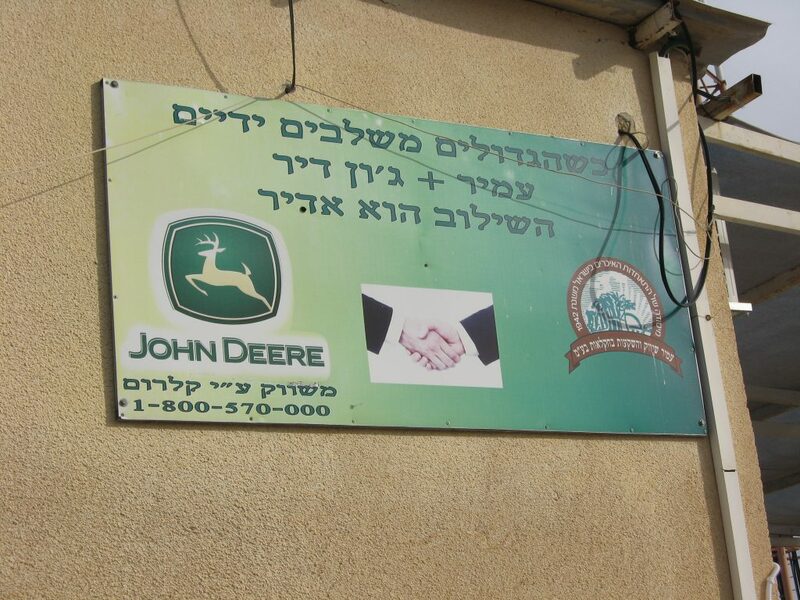 A sign on a packing house in the settlement of Na’ama (also know as Na’omi) reads “When the great join hands, Amir + John Deere, the combination is great” (the original slogan in Hebrew rhymes). Under the John Deere logo it says “marketed by Kalrom”. Kalrom is an Israeli company which imports and markets agricultural and industrial equipment. 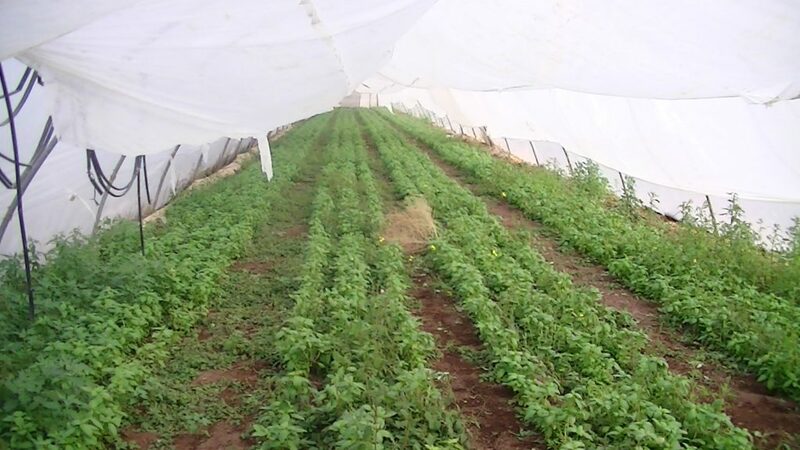 The Amir referred to is Amir Marketing and Investments in Agriculture Ltd, which does just what it says on the tin and has a branch in the nearby settlement of Tomer. Corporate Watch contacted John Deere to ask them about their partnerships with Israeli companies working in Na’ama. The company replied that their “official National Dealer for Israel is the company MIFRAM located in Haifa. West Bank is not part of their assigned territory”. Mifram is an Israeli company which has provided services to the Israeli army and Ministry of Defence. John Deere did not provide any answers to our questions regarding Kalrom and Amir. However, a quick web search reveals that Kalrom’s parent company is Mifram, John Deere’s partner, and that Kalrom has carried out the work on John Deere projects for Mifram in the past. Shipping documents show that Kalrom/Mifram have imported agricultural equipment from John Deere via Houston in the US to Haifa, Israel. If the West Bank is, indeed, not part of Kalrom/Mifram’s assigned territory then why is the company advertising John Deere products in an illegal settlement? It is easy to see how the Israeli agriculture sector might be attractive for a corporation like John Deere. Its water division quotes its strategy for success as being “For those who cultivate and harvest the land. For those who transform and enrich the land. For those who build upon the land” – a statement which could easily be made to fit Israel’s self-mythologising narrative about settlers ‘making the desert bloom’. 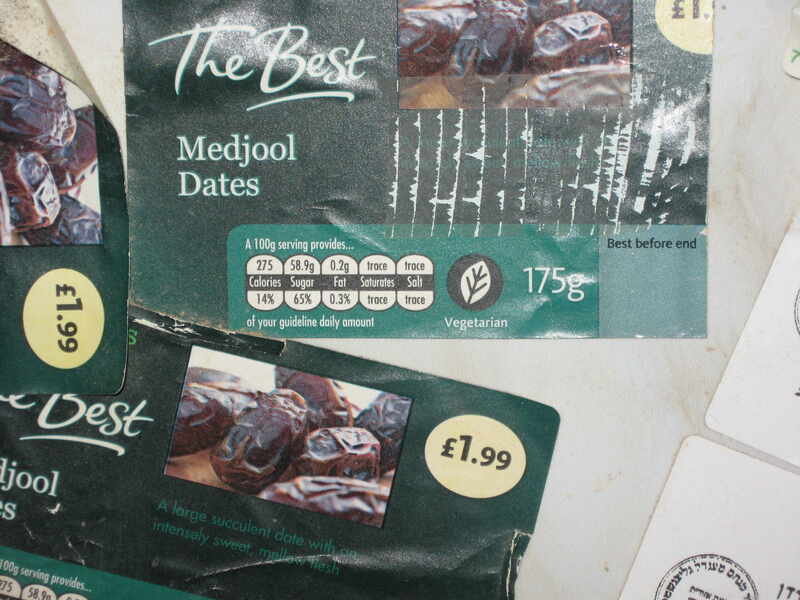 However, by permitting its brand to be marketed in a settlement to settler businesses, the company becomes complicit in the land confiscation and water apartheid that is in place in the Jordan Valley, where settlers receive almost 33% of all the water available to Palestinians in all of the West Bank -not even the most efficient irrigation system can hide that fact. As Corporate Watch has previously reported, the Palestinians who work the land for the settlers in Na’ama are, like most settlement workers, heavily exploited. In February 2013 workers at Na’ama told us that they were paid 80 NIS a day (less than half of the legal Israeli minimum wage) and receive no sick pay or holiday pay and have no health insurance. According to one worker, many of the Palestinians sleep in barracks provided by the settlers just outside the settlement boundary because the checkpoints make it too difficult for them to return to their homes ever day. 18 workers live in two rooms, breaching the Israeli government recommendation of no more than six workers to per room. They are not allowed visitors and are castigated if they return home after 7pm. During the last five years, John Deere has significantly expanded its operations in Israel. In 2008 the company bought the Israeli irrigation specialists Plastro Irrigation Ltd, now known as John Deere Water. This acquisition made John Deere the third largest agricultural irrigation company in the world. In 2010 the company made another major investment in Israel when it bought Beit Hashita Metal Industries. John Deere currently runs three manufacturing facilities in Israel, two for John Deere Water and one for Beit Hashita Metal Industries. 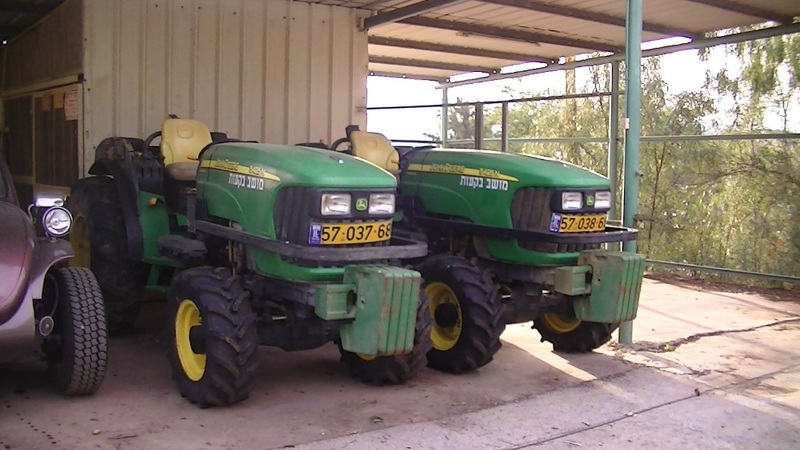 Bizarrely, Israel is also home to something called John Deere Land -a museum of John Deere equipment. Although not affiliated with John Deere, it appears that the museum owner has got the go ahead from the company’s management, and has as his aim to “[…] transmit the tradition and message that Israeli farming has left for us.” An on-line review from one visitor to the museum says that its educational tour “shows the progress of the Jewish pioneers who completely engineered the land, from being unwanted back water of an empire, to land that every grain of soil is loved and prepared to defend for”. According to recent reports John Deere is currently reviewing the future of John Deere Water and there has been speculation that this might involve the option of selling its irrigation operations. Corporate Watch would suggest that John Deere should start by ridding itself of its operations in Israel, which are tainted by the Israeli occupation of Palestinian land. A list of John Deere’s worldwide locations as well as contact details can be found here.